North American Datum of 1927 (NAD27): Local datum well suited to the United States, Canada, Mexico, and the Caribbean. Uses the Clarke 1866 spheroid. North American Datum of 1983 (NAD83): An earth-centered datum that corrects NAD27 coordinates based on both earth and satellite measurements. Uses the GRS 1980 spheroid. Coordinates are very like WGS84 coordinates and can be used interchangeably with them. World Geodetic System of 1984 (WGS84): Earth-centered datum common for datasets with a global extent. Uses the WGS84 spheroid. This is the datum that GPS coordinates are based on. ArcGIS gives us a warning if we attempt to add data to our map that have a different GCS, or datum. For example, if we have one layer depicting the 40 fire behavior fuel models. As with projection on-the-fly, the data frame’s GCS defaults to that of the first layer added to the map, which is NAD83. If we then try to add a fire perimeter shapefile with the WGS84 geographic coordinate system, we get a warning that a geographic transformation may be necessary. A geographic transformation, sometimes referred to as a datum transformation, is a set of mathematical formulas for converting coordinates from one datum to another. At this point, you may specify the transformation by clicking the transformations box in the warning dialog box. In most cases, the transformation at the top of the list will be the best choice. A projected coordinate system (PCS) can reference the same geographic locations using a Cartesian system, which includes a uniform, linear unit of measure. Universal Transverse Mercator (UTM) divides the earth into 60 zones, each six degrees of latitude wide. The figure below depicts a simplified view of UTM zones covering the continental United States. State Plane Coordinate Systems are a good example of a PCS being independent of its map projection. Lambert Conformal Conic projections are used for domains with greater east-west extent, Transverse Mercator projections are used for domains with greater north-south extent. Some use an oblique Mercator projection. 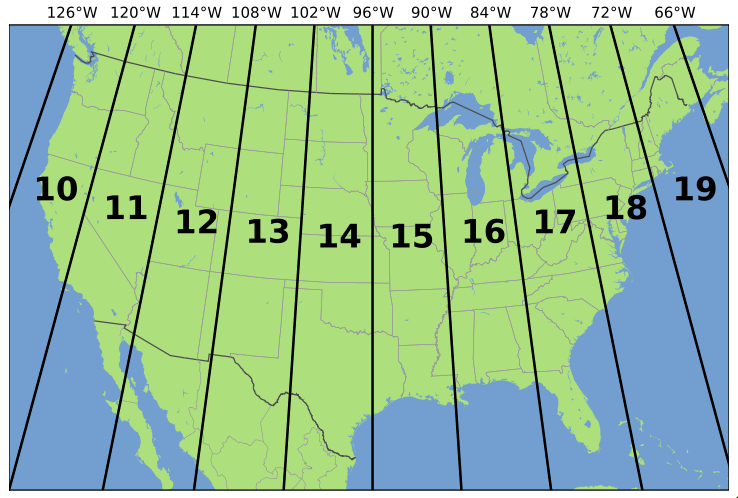 LANDFIRE uses the Albers Equal Area Conic projection for national level data products because it is well suited for data with an east-west orientation at middle latitudes, such as the continental United States. Furthermore, because this is an equal area projection, all areas on the map are proportional to the same areas on the earth. WFDSS (Wildland Fire Decision Support System) Custom Albers Projection is an Albers Equal Area Conic projection that is defined based upon the WFDSS incident spatial domain. In that sense, each incident and its associated fire behavior analyses will have a unique WFDSS Custom Albers projection, By using a custom projection for each incident, centered on that incident, reduces the distortion inherent in all projections in the area around the fire. Among other factors, the custom projection reduces the potential for errors in direction (wind direction, aspect, etc.) that could otherwise be introduced if a non-custom projection were used. Within the WFDSS incident, landscape (lcp) files created for fire behavior analyses are stored in its Custom Albers projection and can only be downloaded in that projection. Other fire behavior outputs can be downloaded in either the WFDSS Custom Albers projection or in a geographic coordinate system. The WFDSS Custom Albers projection is recognized by ArcGIS, and datasets stored in a WFDSS Custom Albers projection can be used in ArcMap like any other dataset. If a shapefile or ascii grid will not display as an overlay on a landscape (lcp) in FARSITE or FLAMMAP, it cannot be used by those systems. It is most likely using a different coordinate system than the lcp does. In this case, the file (feature/shapefile or raster/ascii grid) can be re-projected to the same coordinate system so it can be displayed onscreen and used in reference by the landscape editor in FARSITE. 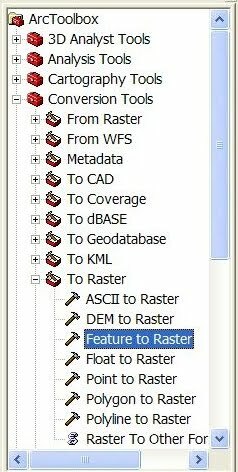 Open a new ArcMap window and add the shapefile or raster file that is stored in the desired projection. By adding the shapefile (or grid) with the desired projection first, the coordinate system of the Data Frame will default to the desired projection. Next, add the shapefile that is stored in the other projection. If the ArcToolbox window is not already displayed, click on the ArcToolbox icon to show the ArcToolbox window. In the ArcToolbox window, click on the plus sign next to Data Management Tools to expand the selection. Next, click on the plus sign next to Projections and Transformations to expand the selection. Next, click on the plus sign next to Feature (for shapefiles or Raster (for grids) to expand the selection. Double-click on Project to open the tool. In the Project window, under Input Dataset or Feature Class, select the shapefile/raster grid that is currently stored with the wrong projection. The Input Coordinate System should automatically default to its projection. If none is displayed, that means that there is no prj file accompanying it. If the projection is known, it can be specified here. Specify an output shapefile or raster grid under Output Dataset or Feature Class. Click on the button next to Output Coordinate System. In the Spatial Reference Properties window that pops up, click on the Import button. Navigate to and select the shapefile that is stored in the desired coordinate system. The new projection properties will load into the Spatial Reference Properties window. Click OK on the Spatial Reference Properties window. Click OK in the Project window to create a new shapefile that is stored in the chosen UTM projection. 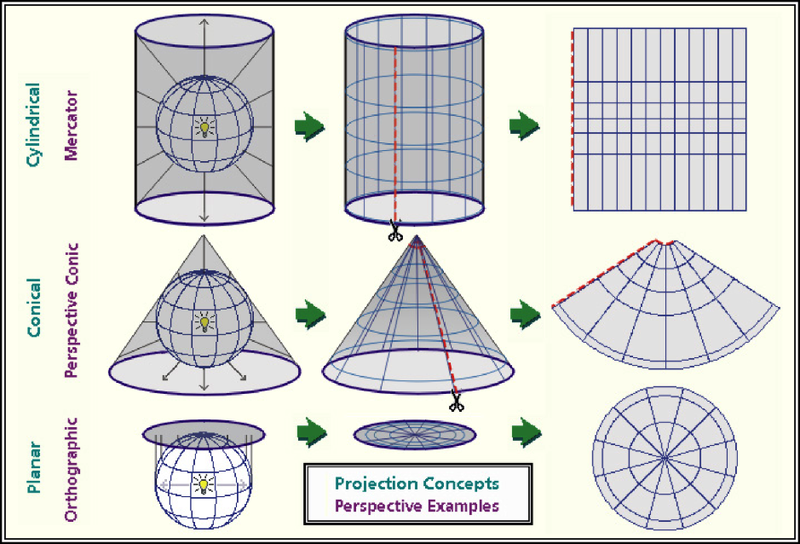 If the user discovers the feature or raster does not have a defined projection; one can be added by selecting Define Projection, found under Projections and Transformations. While traditional use of GIS software has depended on stand-alone datasets, increasingly, much of end-user application is moving rapidly to online resources. ESRI ArcGIS Online (AGOL) provides password protected access to agency, interagency, and public content. There is a NIFC online site that provides a home for many fire management applications. Request access here. ESRI Collector is the companion application that extends visualization and data collection to the field on mobile devices. The ability to take maps in the field on mobile devices, with and without cell service, makes this technology very useful for many different incident response positions. Same login used for AGOL applies here. There is a growing number of web mapping services that can be accessed from their published server over the internet. Look for protocols like Web Mapping Service (WMS) and REST Service to access data without having to download and store it.